How much do you spend on advertising and promotion each year? With ActSmart's brand and promotion service you can reach retailers and consumers quickly and easily - as often as you'd like. If you are a supplier to the Creative, Cycles, Outdoor Pursuits or Snowsports trade you can promote your brand and products to thousands of retail businesses and hundreds of thousands of consumers via ActSmart and The Experts Community. Whether you're just starting out or have been in business for years, ActSmart has the solution that will help your business find new customers without spending a fortune. Even with the right product, businesses still face the challenging tasks of getting information seen and heard by the right people and consistently providing them with relevant, interesting information to help build brand recognition. Lack of time, resources, and contacts in the industry contribute to these challenges. ActSmart's Brand Promotion service can help overcome the challenges listed above by giving you a platform to promote your latest news, events and press releases to the relevant contacts in your market. As a well established business, ActSmart have built up contact details of over 10,000 individuals in the sports and leisure markets. ActSmart's weekly news bulletins are sent to c.4000 contacts in each market we operate in. With open rates around 7% higher than the average UK SME email marketing campaigns (source: smartinsights.com research vs ActSmart email statistics) you can be safe in the knowledge that readers are seeing your news. A potential customer is far more likely to open and read news from a trusted source rather than a sales pitch from a company they are unaware of. If you are a new business looking to reach new customers then the endorsement from ActSmart will boost your brands credibility and help build trust. Gold and Platinum ActSmart subscribers can upload news as often as they like so you are always guaranteed PR within the marketplace. Suppliers are able to share their latest news, product launches or events with both industry contacts and consumers via ActSmart and The Experts. If you are looking to launch a new product to the market, are seeking new dealers or just want to share your successes with the industry then the ActSmart news page is ideal. 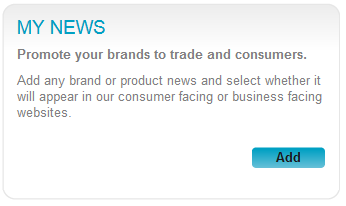 If you have a new product launch, consumer event or product promotion in store, The Experts news page is the perfect place to let consumers know. Find out more about The Experts consumer promotion here. How do I upload my news? Gold and Platinum ActSmart subscribers can upload news content via My ActSmart. Simply log in and upload your news content in the 'My News' box. Gold and Platinum subscribers can upload news to either trade, consumers or both as often as you like by logging in to your My ActSmart account.